The Yamaha V MAX SHO. Quicker, stronger, smarter and lighter – outperforming two strokes on hole shot, displacement, fuel economy and weight. The addition of a five-inch longer shaft means multi-species boaters can now enjoy the benefits that have made the V MAX SHO famous. These models are also perfect for a variety of other applications that require a 25-inch shaft length. By using a highly advanced thermally applied plasma fusion process on the cylinder walls, the V MAX SHO has no conventional steel cylinder sleeves, yet the cylinder walls are 60% harder than steel. That means larger cylinder bores for increased displacement, resulting in more power and torque, without increasing outer cylinder dimensions. Yamaha’s Variable Camshaft Timing system advances and retards the angle of the intake camshaft to dramatically increase power and throttle response in the low- and mid-rpm ranges. This feature helps provide awesome holeshot and midrange acceleration you have to feel to believe. Averaging 12% better fuel economy throughout the RPM range than our venerable 3.3-litre direct-injected 250 hp V MAX Series 2 two-stroke. Air entering the engine is routed through a single 75 mm electronically controlled throttle valve. Working in concert with the Precision Multi-Point Fuel Injection System, they ensure the precise amount of air and fuel necessary for optimum power and fuel efficiency. By using a highly-advanced thermally-applied plasma fusion process on the cylinder walls, the V MAX SHO has no conventional steel cylinder sleeves, yet the cylinder walls are 60% harder than steel. That means larger cylinder bores for increased displacement, resulting in more power and torque, without increasing outer cylinder dimensions. It also results in dramatically lighter weight, better cooling, and the “micro-textured” cylinder walls help reduce friction loss, further increasing performance and enhancing reliability. 4.2 litres of class-leading displacement teams with individual intake and exhaust camshafts to provide more precise valve timing control with fewer moving parts than conventional rocker arm systems for increased reliability. This superior design also allows for use of 4 valves per cylinder which exchange intake and exhaust gases more efficiently for responsive power and increased fuel economy. Intake valves are 14% larger and exhaust valves are 10% larger than our 3.3L DOHC system. Yamaha’s Variable Camshaft Timing system advances and retards the angle of the intake camshaft to dramatically increase power and throttle response in the low- and mid-rpm ranges. This feature helps Yamaha’s new 4.2-litre big-bore V MAX SHO four stroke provide awesome hole shot and mid-range acceleration you have to feel to believe. The Yamaha V MAX SHO is faster than even the vaunted V MAX Series 2 that it replaces. This means four stroke smoothness, convenience, and reliability; with top speed better than that of our direct-injected two-stroke of comparable horsepower. Engine exhaust is routed through a maze before exiting above the waterline through the idle exhaust relief outlet, for unbelievably smooth and quiet operation. A mufflerless design creates a more direct exhaust flow and a pleasing sound of power at idle. Averaging 12% better fuel economy throughout the RPM range than our venerable 3.3-litre direct-injected V MAX Series 2 two stroke. All air entering the engine block of the V MAX SHO is routed through a single 75mm electronically controlled throttle valve. Working in concert with the Precision Multi-Point Fuel Injection System, they together help ensure the precise amount of air and fuel necessary for optimum power and fuel efficiency. Yamaha’s exclusive “In-Bank” exhaust system exits downward through the center of the engine between the “V” of the cylinders, rather than on the exterior side. This increases combustion efficiency for more power and torque, and also provides for a more compact shape. The Yamaha V MAX SHO is 34 pounds lighter than the V MAX Series 2 it replaces. In fact, no other equivalent horsepower production V6 bass outboard is lighter, including two strokes. From the specially re-designed engine bracket to the new lightweight cowling, every ounce of weight savings has been realized without sacrificing durability. The specially contoured high performance lower unit features a unique curved skeg design for straighter tracking, while forward-mounted water inlets are 81% larger than V MAX Series 2 for increased cooling capacity. Inside are specially heat-treated gears for increased durability. 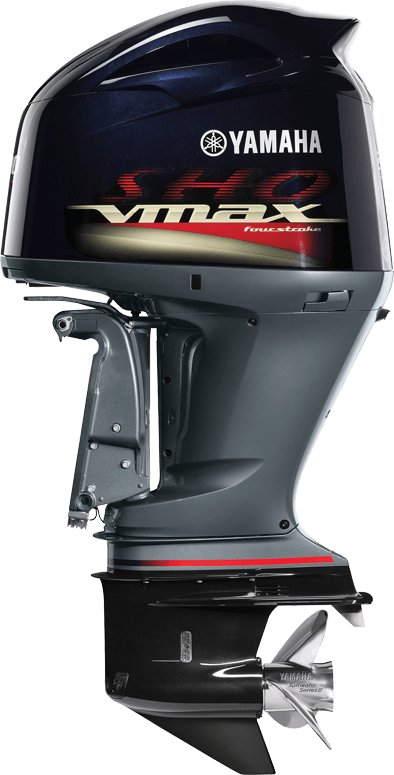 With 46 amps of total alternator power at 1000 rpm and a full 50 amps from 2000 ~ 6000 rpm, V MAX SHO outboards offer the kind of charging power needed to help operate today’s wide array of on-board electronic devices. The V MAX SHO features an advanced cowling drain system, to easily and efficiently drain away any water that enters the cowling during normal engine operation. Incoming air is routed through a labyrinth of passages that trap and drain water before it enters the engine’s intake, for maximum reliability. 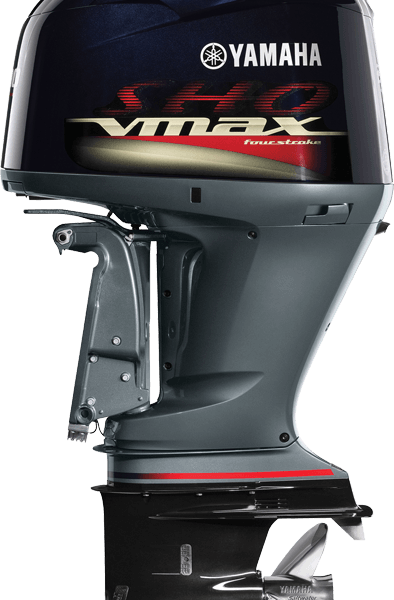 V MAX SHO outboards have an exhaust pressure reduction system, which not only helps keep the propeller hub cooled from hot exhaust gases, it also helps provide power by “forcing” those gases out of the engine during the critical hole shot and acceleration phases. 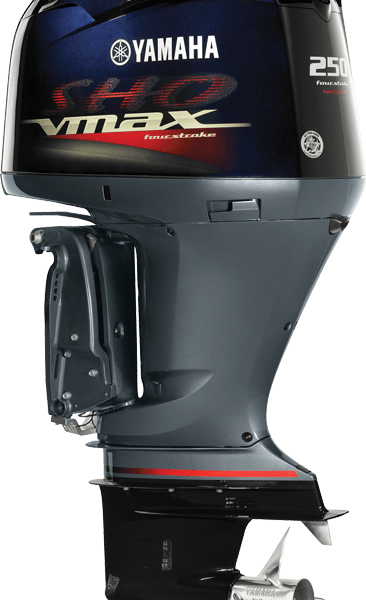 All V MAX SHO outboards utilize a large, on-engine water separating fuel filter with a water sensor. Used in conjunction with Yamaha’s 10-Micron Water Separating Fuel Filter, it helps separate water and contaminants from the fuel before they can reach the outboard’s other filters and fuel injectors. A multitude of advanced sensors constantly provide vital atmospheric and engine conditions to the Engine Control Module (ECM), which instantly makes the precise adjustments for optimum performance, durability and efficiency. 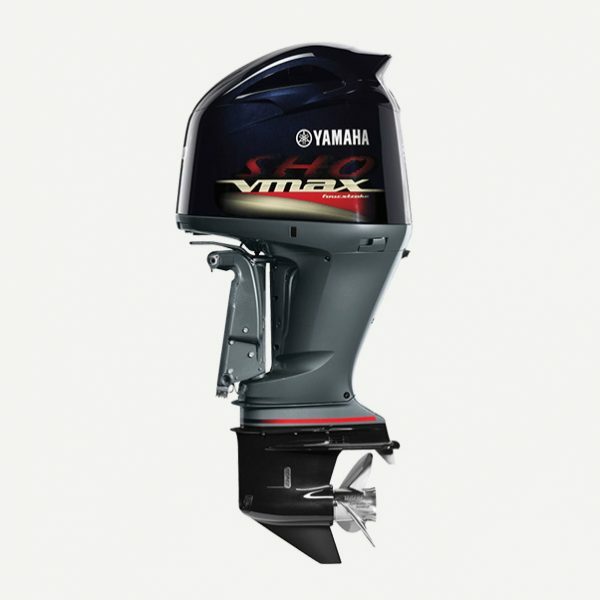 Yamaha V MAX SHO outboards are cable-actuated, allowing use of our 6X3 flush side-mount remote control. You can even add your own foot-operated throttle for additional convenience. 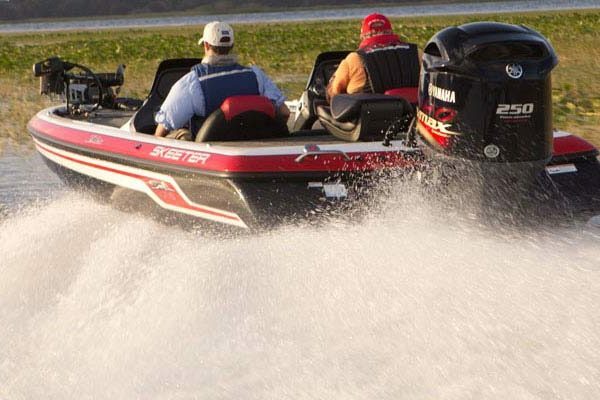 Yamaha V MAX SHO outboards feature a Blow-by Gas Re-Burning System. This separates any unburned combustion gases and re-routes them to the air intake system where they are burned again, helping maximize fuel efficiency and earn a CARB 3-Star emissions rating.